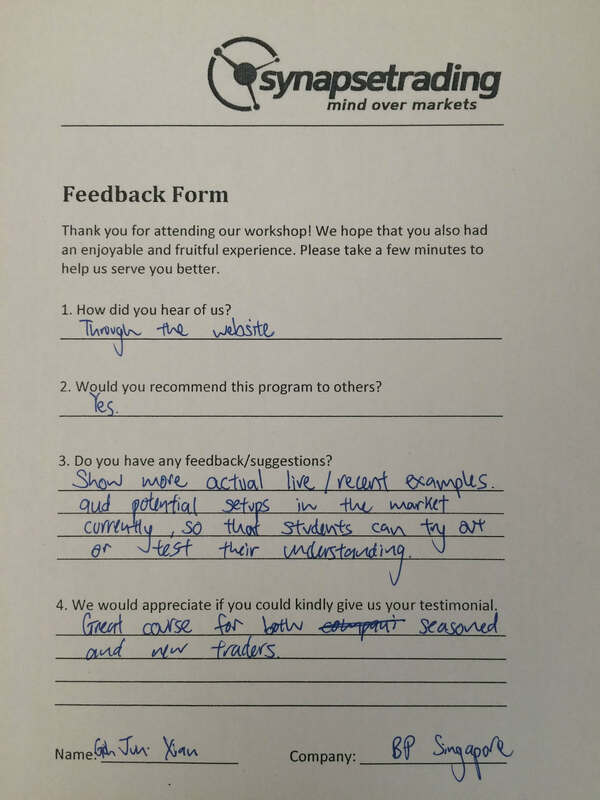 Thank you Jun Xian for your kind testimonial, and we wish you all the best in your trading! Every quarter, we accept only one selective batch of new aspiring traders, and share with them the secrets of behavioral analysis and how professional traders time the market! And so far, we have 100% positive reviews and a strong YES! when asked if they would recommend their friends and family. http://synapsetrading.com/wp-content/uploads/2014/03/logo-header1.png 0 0 Spencer Li http://synapsetrading.com/wp-content/uploads/2014/03/logo-header1.png Spencer Li2015-05-29 04:45:332016-02-07 18:33:06Testimonials: "Great Course for Both Seasoned and New Traders"
Testimonials: “Very Detailed and Good Explanation of Concepts"
Testimonials: "Very Practical and Definitely Can Be Implemented"